Iomega has started shipping their 16x10x40x CD-RW internal drive today. One of the most important features in any CD "burner" is speed and this latest drive from Iomega has a 16X write speed across the entire disc surface. This is important, because some manufacturers rate their CD-R write speed on the outside, where the greatest data throughput occurs. Since throughput is slower in the center of the CD, the overall speed is slower and it takes longer to burn your CD. 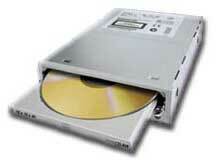 The Iomega 16x10x40x CD-RW internal drive should take less than five minutes to create a 60-minute audio CD. This new drive features BURN-Proof technology (which stands for Buffer UnderRuN-Proof). This technology keeps you from making "coasters", those worthless CDs that are created because your computer did not maintain a steady stream of data to the CD-R drive. Using BURN-Proof technology, the Iomega 16x10x40x CD-RW drive can automatically pause during recording and wait for the computer to resume its data flow. Once the data flow has been regained, the drive then resumes from where it paused. Now you won't have to walk away from your computer each time you burn a CD -- you can now perform other computer tasks during the recording process. Since this Iomega drive also reads fast, you can extract digital audio from a music CD at 32X. This means you can "rip" a three-minute song from a CD in as little as six seconds. That's quick!